So, You Think You're an Advertising Slogan Savant? Take Our Quiz and See How You Score! So, You Think You’re an Advertising Slogan Savant? Take Our Quiz and See How You Score! Before you tackle the chore of taking our amusing advertising jingle quiz, you might want to pour yourself a glass of the “Real Thing” (Coca Cola) or grab a steaming mug of “your cup of inspiration” (Nescafe Blend 43). However, we do feel like we should warn you: Imbibing any beverage that promotes itself as “tastes great” but is “less filling” (Miller Lite beer) could affect your judgment and skew your results. All kidding aside, we hope you have as much fun when you take our quiz as we had when we compiled it. 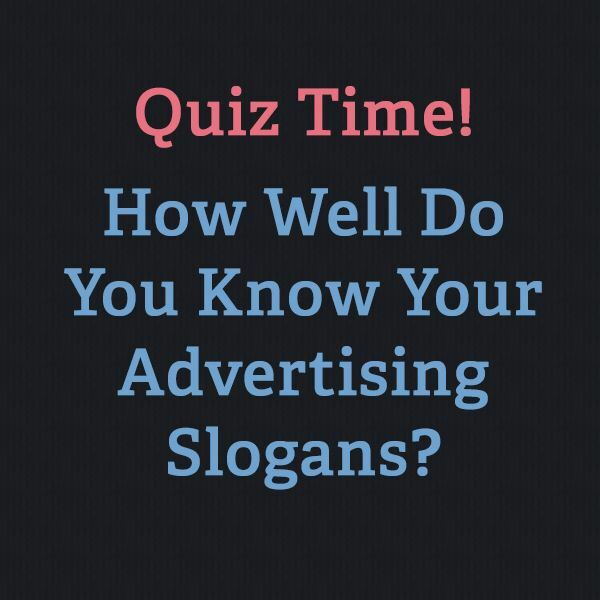 Best of luck as you work your way through this range of easy to challenging questions about popular brand and product slogans and taglines. Do You Know These Slogans?